Reams have been written about this small masterpiece by Leonardo- Mona Lisa, and the gentle woman who is its subject has been adapted in turn as an aesthetic, philosophical and advertising symbol, entering eventually into the irreverent parodies of the Dada and Surrealist artists. The history of the panel has been much discussed, although it remains in part uncertain. According to Vasari, the subject is a young Florentine woman, Monna (or Mona) Lisa, who in 1495 married the well-known figure, Francesco del Giocondo, and thus came to be known as ``La Gioconda''. The work should probably be dated during Leonardo's second Florentine period, that is between 1503 and 1505. Leonardo himself loved the portrait, so much so that he always carried it with him until eventually in France it was sold to François I, either by Leonardo or by Melzi. From the beginning it was greatly admired and much copied, and it came to be considered the prototype of the Renaissance portrait. It became even more famous in 1911, when it was stolen from the Salon Carré in the Louvre, being rediscovered in a hotel in Florence two years later. It is difficult to discuss such a work briefly because of the complex stylistic motifs which are part of it. In the essay ``On the perfect beauty of a woman'', by the 16th-century writer Firenzuola, we learn that the slight opening of the lips at the corners of the mouth was considered in that period a sign of elegance. 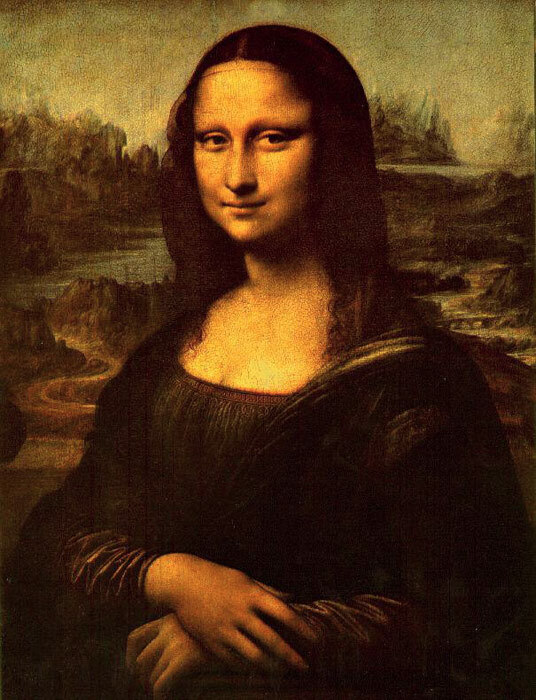 Thus Mona Lisa has that slight smile which enters into the gentle, delicate atmosphere pervading the whole painting. To achieve this effect, Leonardo uses the sfumato technique, a gradual dissolving of the forms themselves, continuous interaction between light and shade and an uncertain sense of the time of day.